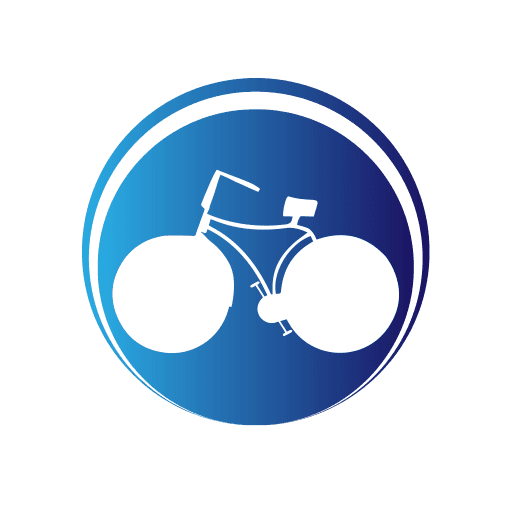 If you have been riding a bicycle for a while, you have probably come across the need of proper cycling shoes and for that matter, if you choose to go cycling in the mountains, it is recommended that you use mountain biking shoes. There are a lot of biking shoes out there in the market right now. So to choose the right one best suited to your exact requirement is quite a tough task. Hopefully, this buying guide will help you choose the best mountain bike shoes and save you both time and money. 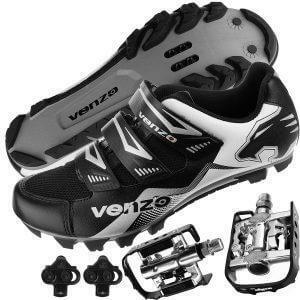 The Venzo Mountain Bike Cycling Shoe is an award-winning product. They are extremely lightweight. The shoes quickly dry up and employ a highly breathable synthetic mesh to ensure air flow. Comes with an upper layer made up of a synthetic mesh that is breathable and quick drying. It regulates air flow and thereby prevents feet from sweating. It comes equipped with a removable sock liner. The design is low-cut for quick fit and comfort. Ultra lightweight, weighing just 640 grams. The sole stiffness is perfect for urban as well as off-road use. Fully compatible with all Shimano SPD pedal systems. The kit comes with all the things necessary to get you started right away: namely- shoes, pedals, and cleats. There are no drawbacks as such with this product, except that the instructions on the installation of pedals and cleats are not clearly stated. Overall, this is a great kit to spend your money on as it is versatile, comes with everything that you will need and offers great features. The Pearl Izumi All-Road III Shoes is a do-it-all product at an extremely affordable price. It offers adjustability, 1:1 Anatomic closing, performance, and comfort that are really useful on the road. 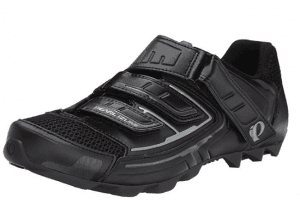 The shoes are very light in weight and are very comfortable for longer rides. Low-cut design for weight reduction, comfort, quick fit and pedaling efficiency. The upper layer is made up of synthetic leather and nylon mesh that are breathable and very durable. 3 velcro straps in the form 3 hook and loop closures for enhanced adjustability and proper fit. This also helps in hot-spot elimination. The upper lining facilitates easy cleaning. It is very lightweight. Weighs just around 280 grams. The soles are stiff enough for a long but comfortable ride. The soles offer good arch support as well. The sole could be a bit stiffer. Overall, a great budget mountain biking shoe with all the required features! It is a great entry level shoe at a very competitive price point. The Diamondback’s Trace Clipless cycling shoes is a great product in terms of styling and durability. It features a breathable mesh upper liner and a full suede body. It offers a good amount of grip, perfect for mountain biking and touring and can be used for indoor cycling as well. The upper lining is made up of high-quality synthetic leather along with a breathable nylon mesh. It can be used with platform pedals. Comes with a 3-strap Velcro closure system. The upper lining is a bit on the stiffer side. 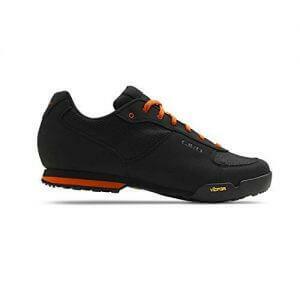 Overall, one of the best clipless pedal compatible biking shoes out there and that too at an affordable price! The Giro Rumble VR mountain bike shoes is a very sophisticated product. It is ideal if you are looking for versatility. It is developed and designed for use in both flat and clipless pedals. There is a good amount of traction provided by the Vibram rubber used on the outer sole of this shoe. Perfectly suitable for flat pedals as well as for clipless pedals. Comfortable for walking up a trail. The footbed is made out of EVA for added comfort. The Vibram rubber used on the outside is very durable and offers a good grip, thanks to the aggressive tread patterns near the heel and the toe. Less suitable for tough terrain. This is basically an all-day shoe for easy going riders. Other than providing good support for riding, it also offers good grip and a lot of comfort for walking up trails as well. The Shimano MW7 is one of the most versatile shoes out there. They offer enough protection for the winter and can be used all-year-round as well thanks to its breathable outer lining. The fit is excellent in terms of comfort and will suit most of you. Beautifully insulated for tackling the worst winter conditions. Rubber outsole offers good grip in wet conditions. It comes with a Fleece lined insole. It is fully SPD compatible. There are no drawbacks associated with this product. To sum it up, a Boa system replacing the thin lace and Velcro closure systems could have made this product even better. 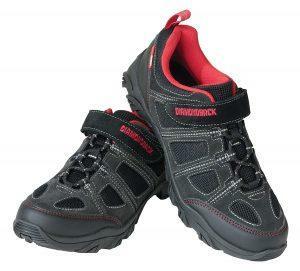 Overall, it is a sturdy and a comfortable shoe, ideal for winter as well as for use all-year-round. 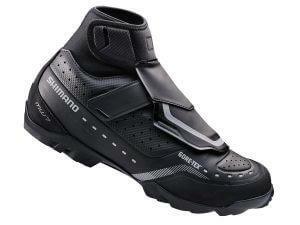 Shimano SH-XC61 Shoes are ideal for cross-country mountain bike shoes. It is designed with a stiff midsole to maximize power transfer. It is also developed with lightweight materials so as to save weight. Designed specifically for cross-country use. The outsole is carbon reinforced. It is stiff and offers adequate power as well as comfort. The sole is lightweight and has a lower stack height. Offers great stability while on the bike. The closure mechanism is ratchet strap/ hook-and-loop. This is durable and reliable as well. There are no drawbacks to this product other than some mixed reviews and reports from some users. To sum it up, The Shimano SH XC61 is a great cross-country shoe that is competitively priced and is durable as well. 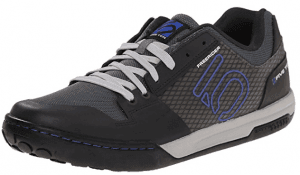 The Five Ten Men’s Freerider Mountain Bike shoes is a potent platform pedal mountain bike shoe. It is specially designed to look like a normal sneaker but it uses Stealth S1 rubber for enhanced pedal grip and durability. The upper lining is made up of high-quality leather and fabric. It boasts a lace-up enclosure. The Stealth S1 rubber offers a good amount of grip. The inner sole offers comfort as well as durability. Offers the right amount of stiffness for platform pedals. It has a lot of colors to choose from. It has a lack of treads. The design is a bit narrow. Overall, it is an ideal choice for platform pedal mountain bikes. The price is affordable and it is worth to spend your money on. So, Why Do You Need The Best Mountain Bike Shoes? There are many reasons to go for proper mountain bike shoes. If you wear a specialized bike shoe, you reduce the chances of getting injured while riding. These shoes are designed, especially keeping in mind the safety of the user. They are designed with a stiff inner sole that does not fold upon impact. The folding effect commonly seen in your tennis shoes or sneakers can have detrimental effects on your feet, such as developing hot spots or even severer damages in case you meet with an accident. With a strong stiffer sole, your feet are naturally supported and safe. With inbuilt clip designs specifically designed to cling onto the bike pedals, these shoes make it easier to hold the pedal in place while you push and even exert force while on the upstroke, as and when needed. 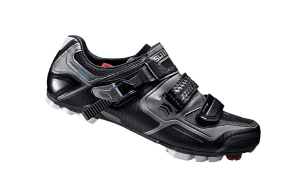 Though there are shoes out there with clipless systems claiming the same efficiency, most of the new generation biking shoes come with inbuilt clip systems allowing you to pedal faster and with greater power. Mountain biking is quite tough. It can get all rough in a matter of seconds and you can get thrown off the bike if you don’t apply proper grip and pedal placement. These shoes have a strong grip, clipping your feet onto the pedals and adding a lot of support and confidence so that you can stay clutched to your pedals. This helps to stop them slipping off from under your feet. What Should You Look For While Buying A Mountain Bike Shoe? Manufacturers use different materials in their soles and all of them have different levels of firmness. Choose the one that suits you best and, more importantly, what you are comfortable with. If you plan to use it especially off-road, you should probably go for off-road tread patterns; whereas if you plan for urban use, go for benign treads. The vital thing to look for while buying a mountain bike shoe is the fact that it should be durable. Which materials have been used in its making, the treads, the linings, the soles etc. should be checked positively. There are a lot of cheap products out there that won’t last a season. So choose the reputed and major brands and all will be fine. So, here are all the categories consisting of the best mountain bike shoes out there now. All the chosen products are from reputed brands with positive customer reports and reviews. So they are tried and tested models with high ratings and recommendations all over.As always, you should carefully choose the suitable one. It should match your exact requirements. What are the Best Mountain Bike Tires?